The Fisher Scientific Inverted Phase Contrast Microscope under the hood is really a Nikon Eclipse TS100 with a Fisher label. This powerful compact microscope comes with the innovation you’d expect from Nikon. Nikon’s infinity optical systems give you clear, sharp flat images, with higher apertures and longer working distances. This inverted Phase Contrast Microscope is designed for comfortable continued use, with ergonomically located controls, a low profile stage, and Siedentopf-type eyepiece tubes set at a 45° angle for either sitting or standing use. The eyepieces also feature one of the widest fields of view at 22-mm. It’s compact size and weight makes it ideal for either benchtop use or within a safety hood. 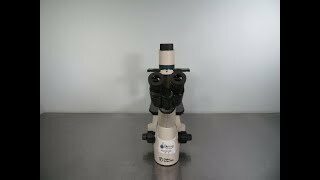 The Nikon Eclipse TS100 Inverted Phase Contrast Microscope backward-facing nosepiece is can be set in 5 positions and with ample space surrounding the area, setting the nosepiece is simple no matter the user, even with gloved hands. This inverted phase contrast microscope comes with a halogen lamp, to give better color integrity, excellent for microphotography. Dimensions 21" x 9" x 20"
This Fisher Scientific Micromaster Inverted Phase Contrast Microscope has been inspected, and performed beautifully. All of our lab equipment comes backed with our standard warranty. Should you have any questions please don't hesitate to contact us.